Micro Electric Corporations Ceramic infrared heating elements are efficient, heaters which provide long wave infrared radiation. They are used in a diverse range of industrial processes such as thermoforming, paint curing, printing and drying. They are also used very effectively in infrared outdoor heaters and infrared applications. Micro electric Corporations Ceramic elements operate in the temperature of 300°C to 700°C (572°F - 1292°F) producing infrared wavelengths in the 2 - 10 micron range. 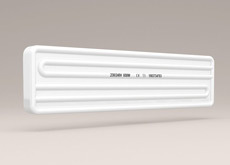 Most plastics and many other materials absorb infrared best in this range, which makes the ceramic heater the most efficient infrared radiant emitter on the market. A range of aluminised steel reflectors are also available to ensure that most of the radiation generated is reflected forward on to the target area. Our Infrared Heaters are designed to produce maximum output in form of heat energy. They are constructed by a firmly burnt-in heating coil. The heater incorporates highly heatproof resistance wire that provides safety against any damage. We supply Custom Wattage Infrared Ceramic Heaters as per the requirement of our clients. Longer service life is achieved since the resistance of the heaters is made to remain constant over the whole temperature range. The glaze used in this heater has excellent radiation properties therefore the radiation efficiency is also very high. This heater is available with Color Changing Feature as Yellow Ceramic IR Heater (CC FSR). The material used for the production do not oxidize therefore the surface always remains clean and do not wear out. 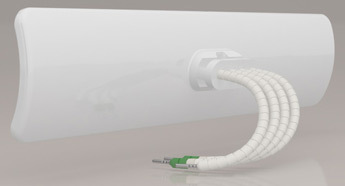 As the coil is embedded in ceramic material, it can be installed in any possible position. 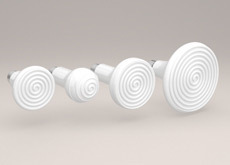 Ceramic Flat Infrared Heaters are constructed by a firmly burnt-in heating coil. They consist of high heatproof resistant wire. These heaters are available in power ratings of 250w, 400w, 600w, 800w & 1000w. These heaters come with & without thermocouple. 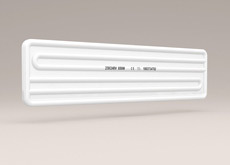 Insulated Ceramic Infrared Heater is a special type of heater with proper insulation on the backside with highly efficient heat insulation material. They have a very long life even when used regularly. The special insulation keeps the internal parts safe and higher temperatures can be achieved easily without any risk or trouble. The insulation minimizes the heat losses and reduces the temperature in the wiring area. Hence, this can be regarded as a energy saving product. These heaters are available in various shapes with different power capacity up to 1000W. Fast heat up time approx. 2 minute. The Micro electric corporation’s thermocouple operates on the principle that clear quartz glass is an excellent transmitter of infrared radiation. Infrared heaters are one of the most efficient and rapid means of transferring heat into an object. By placing a clear quartz tube over the heating wire and keeping the thermocouple in direct contact with the tube, the heat is rapidly transferred into the thermocouple, and so the temperature change in the element is closely followed. This system prevents displacement of thermocouple during the casting process. 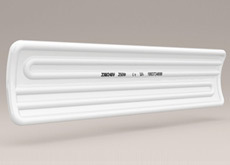 By using a quartz tube any difficulties with regard to electrical interference between the heating wire and the thermocouple are avoided as quartz is an excellent insulator. With the thermocouple permanently in contact with the quartz tube, which is of consistent diameter, the distance between the thermocouple and the heating wire is maintained constant for all elements. This in turn will lead to a consistency in the thermocouple readings of the ceramic elements. The thermocouple also gives an enhanced response time as can be seen from the results shown in the graph. As can clearly be seen, the thermocouple has a much faster response time and so gives a more representative indication of the heating element temperature. This is quite advantageous to today's production systems which demand increased temperature control as a way of reducing operating times and increasing productivity. Micro Electric Corporation manufactures many different wire lead lengths with a range from 100mm (the standard wire length) to a maximum of 300mm. Copyrights Reserved 2011, Micro Electric Heaters.